Welcome back to our series about apartment amenities! 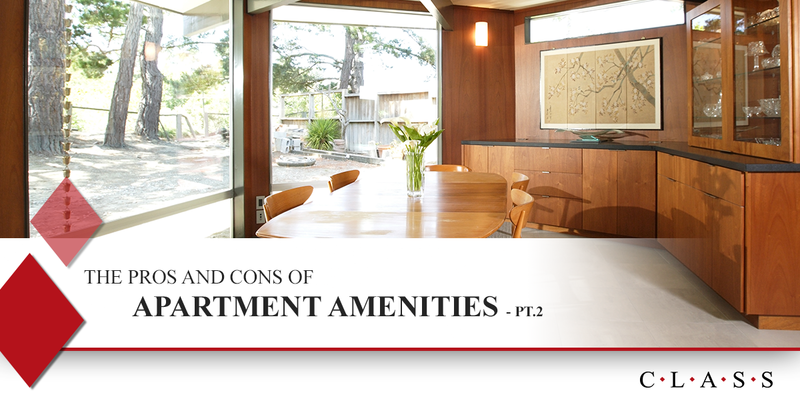 In part one, we looked at some of the advantages that amenities provide, for both you and your tenants. In this post, we’ll look at some of the downsides, so that any property owner reading this can make a well-informed decision on whether or not to implement amenities in their own building. Unfortunately, amenities vary so much in size and scope that we can’t make a blanket statement on how much they cost, but it suffices to say that it always comes at a price. Adding washers and dryers to an apartment may look easy on paper, until you realize the logistical nightmare of figuring out the plumbing, installation, and long-term maintenance costs of those machines. More ambitious projects, like a pool, will require an extensive remodel on your property, and will also have their own share of maintenance costs in the long run. This means that every property owner will have to take a look at their unique situation and settle on options that will provide the most value for their budget. That could mean something simple like a store-bought fire pit, or a massive project such as building a workout facility. If you’re looking for advice from experts in leasing services, Class Inc can help you analyze your options. For the most part, a property owner can include a condition on the lease agreement that they are not liable for damages or injuries that tenants inflict on themselves through the apartment amenities. Amenities have the possibility of opening the door to legal disputes, should a client end up hurting themselves or finding some other form of offense. Even if you’re legally protected through terms in your legal agreement, pretty much anyone can agree that legal battles are a serious pain and a major drain on the wallet; it’s best to avoid them altogether if possible. So keep that in mind if you’re installing firepits, workout machines, hot tubs, and more be sure to have a good conversation with a lawyer on the best practices of implementing these features to your tenants. The unspoken law of apartment amenities is that they need to be implemented well, or else they could backfire on you. Consider an outdoor pool and grilling area. On paper, this is a great idea. It’s a lovely spot for summertime relaxation, family bonding time, and a space where tenants can cook delicious, bona fide grilled food. It’s no doubt to attract renters to your property and keep them! However, all bets are off if the final product is lackluster. If your pool is ugly, cramped, and ill-maintained, using it might feel like more of a chore, and nothing kills spirits faster than getting excited to barbecue and then realizing there’s no propane. Amenities can be great for you, but when they’re poorly implemented, they can lead to tenant dissatisfaction and poor reviews — leaving you in a worse position than you were in before, and with a lot of money in the hole to boot. If you do amenities, do them right! If you’re looking for a way to fill vacant apartment slots on your property, amenities can be a boon to you as long as they’re done right. But there are many other ways to attract new renters as well, and we can help you with them at Class Inc. Our team of professional leasing agents have helped countless property owners with their leasing needs, and we’re prepared to create a unique solution that’s custom tailored to your needs. Contact us today!